Størrelse af denne forhåndsvisning: 400 × 599 pixels. Andre opløsninger: 160 × 240 pixels | 320 × 480 pixels | 400 × 600 pixels | 839 × 1.257 pixels. 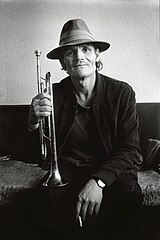 English: Chesney Henry "Chet" Baker, Jr. /American jazz trumpeter, flugelhorn player and singer. Here in Belgium 1983.
nuværende 18. feb 2017, 11:21 839 × 1.257 (229 KB) Sebastian Wallroth Cropped 5 % horizontally and 3 % vertically using CropTool with precise mode. 26. nov 2015, 21:57 884 × 1.299 (155 KB) Spinster Reverted to version as of 15:53, 27 August 2010 (UTC). Black border is part of the original photo and composition. Please fork into a separate cropped file if needed.